I’ve talked a lot lately about ideas on selling your products and services. The reason is, I’ve been asked a lot in the last couple of weeks. Everyone is trying to find unique and different tactics to get their products in front of their customers, I completely understand. There are so many products and so many people trying to get your attention that standing out in the crowd seems difficult. Not to worry, I have good news, there are all kinds of ways to stand out! Here are a few ways I’ve helped customers stand out with marketing tactics in the last couple of weeks. 1. Add a story to your products that can be used during the holidays. For example, Plow and Hearth has Rainbow Fireplace Flame Crystals for Wood Fires. Perfect for Christmas morning in front of the tree while opening gifts with the family. They tell this story and provide a picture of the family sitting around the tree and fire enjoying the colored flames. 2. Add-on gift when a customer purchases your product. For example, when a customer purchases over $50 they will receive _________ I recently purchased a sweater and received a matching scarf. 3. Partner with another company to bundle your product together for added exposure. Think outside the box here, like IHOP and the Hobbit movie did. 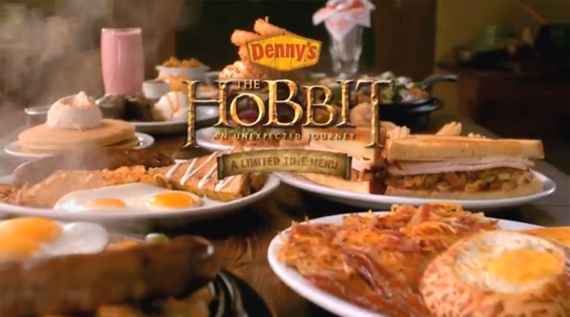 IHOP has been advertising “The Hobbit: The Desolation of Smaug ” breakfast specials for months now leading up to the opening of the movie. Not a likely “partner” but it works. 4. Limited Supply. If you have a product that you have a limited supply of, advertise it to your customers in the form of postcards, emails or calls. A lot of people would love a deal this time of year and could use the tax write off. This is the scarcity tactic. 5. Offer Flexible Payment options. More people than you can imagine would do business with you, especially this time of year, if you gave them the option to purchase with multiple payments spread out over a couple of months. If you are able to extend this kind of payment option give it a try, you could see a jump in sales. What kind of offers do you make this time of year? What has worked for you? I’d love to hear, share them in the comments below, or email me at smiller@mindwhirl.com.